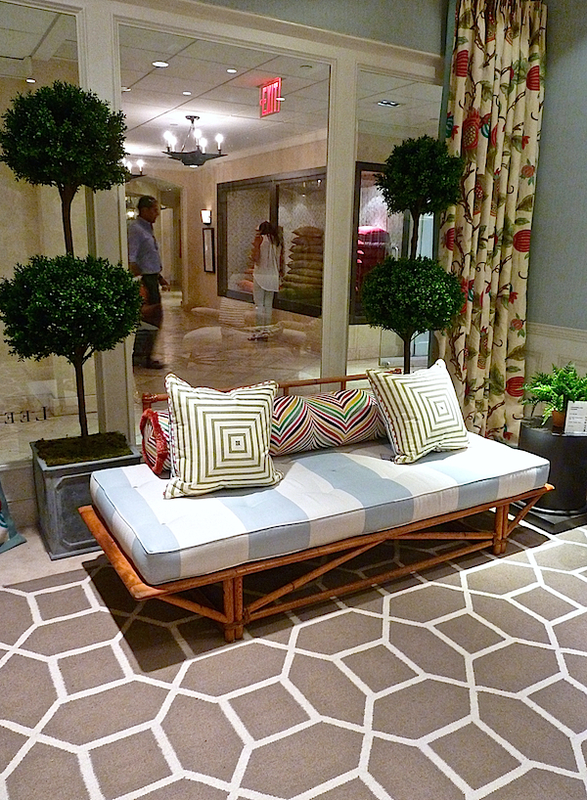 Several times a year, Lee Jofa redesigns the front room in their NYC D&D showroom to celebrate a new collection, up and coming designer or both. 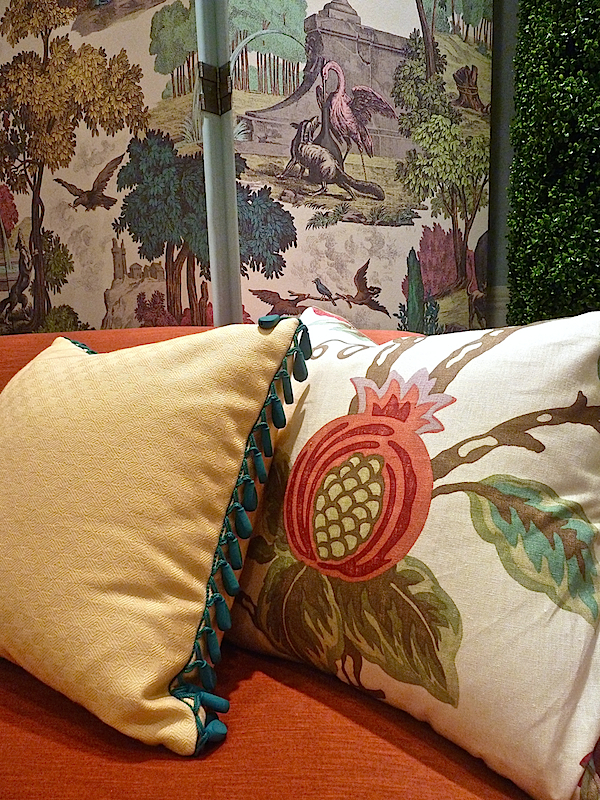 I was delighted last week to visit the unveiling of their latest incarnation by designer Lindsey Coral Harper. Raised in Georgia and an alumna of fellow southerner Richard Keith Langham‘s firm, Lindsey infuses her designs with a modern, colorful and gracious twist on tradition. You may remember her amazing tabletops I have covered at the Lenox Hill Gala in the past and in this year’s video of the event. 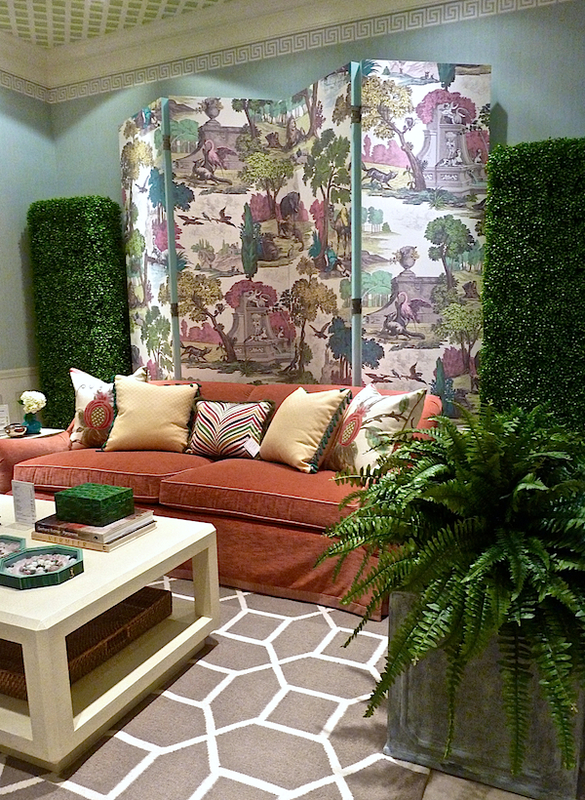 Taking her cue from the fabulous Cole & Son Versailles Grand wallpaper that debuted earlier this year at Paris Deco Off, she created a garden room of classic pieces in fresh and vibrant colors. Although solid, the piping on the generous Bath sofa gives the piece a little zip. And color coordinated pillows in the linen floral Mandovi print that is also on the curtains, Concord Weave in yellow and fun Groundworks zig zag Prismatic add layers to the scheme. But it’s of course the details that offer that extra something like the fun Wood Drop trim in teal that so perfectly references the screen. 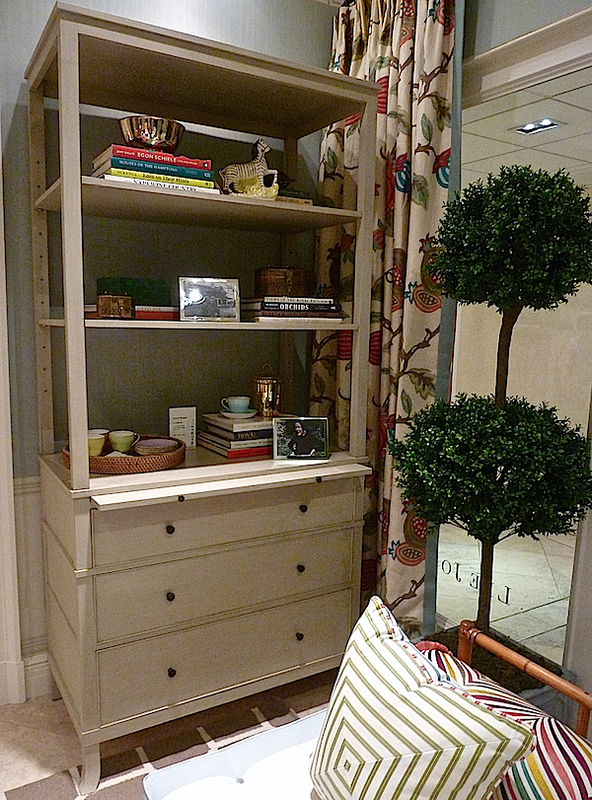 The faux boxwood panels are a clever addition, adding to the verdant effect of the garden room with the casually chic tufted Cheshire Chairs in front. 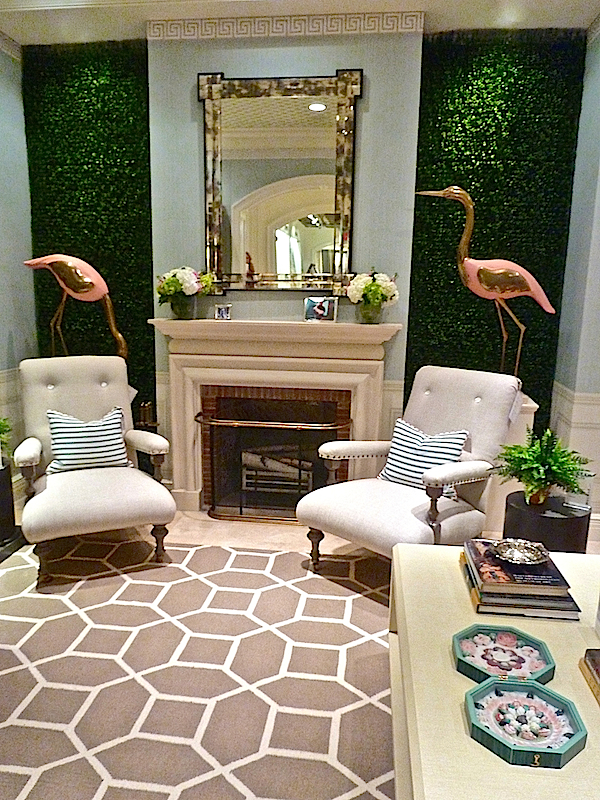 But of course it’s the fabulous vintage brass flamingos, which Lindsey scored from Scout Design Studio through Instagram, that seal the deal – southern gentility (note the greek key border above the mirror and lattice ceiling) with just the right amount of Grey Gardens inspired eccentricity. 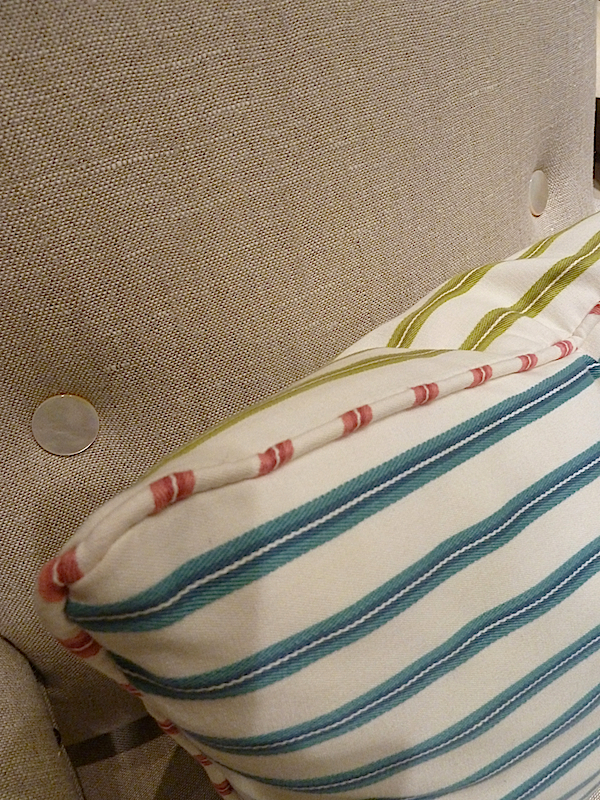 An updated colorful twist is including the teal, citron and fuchsia colorways of the Lucia Stripe on the pillows. Another vintage find, the rattan daybed, is the perfect vehicle for the summery Winfield Stripe from Blithfield. And to add to the vintage charm, Lindsay tufted both the daybed and the Cheshire chairs with vintage mother of pearl buttons she found at Tender Buttons. In contrast to the vintage pieces, in the corner stands the Howard Étagère by Robert Brown for MacRae, a handsome update on tradition that could be a welcome addition to almost any room. 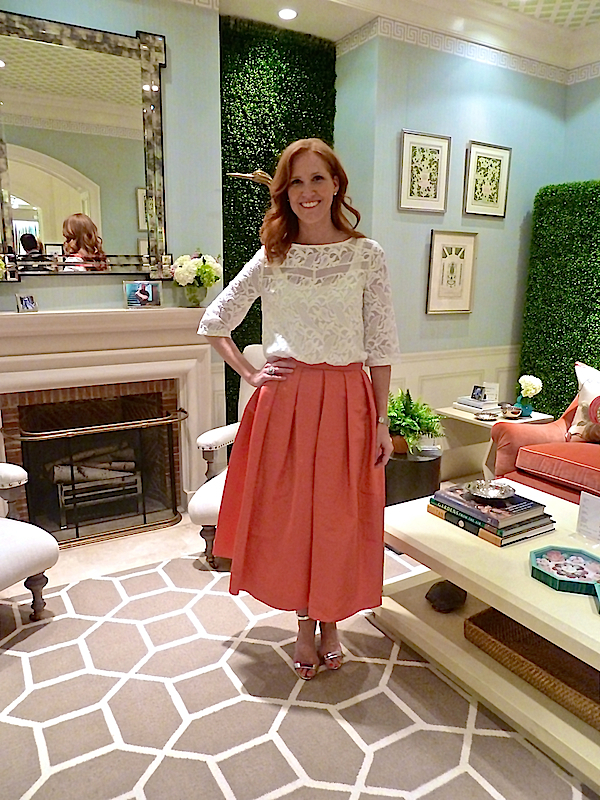 Of course the designer was perfectly color coordinated for her beautiful room. Congrats Lindsey – I could move right in! Be sure to stop back on Thursday for the latest episode in Susanna Salk’s and my video series as we visit Alex Papachristidis at his chic family home in the Hamptons. This entry posted in furniture, interior design. Entry Tags: interior design, Lee Jofa, Lindsey Coral Harper Bookmark the permalink. What an you tell me about the coffee table? Vendor info please….. Thanks Leslie! It’s the Elle and Marks Santa Barbara table available through Lee Jofa. 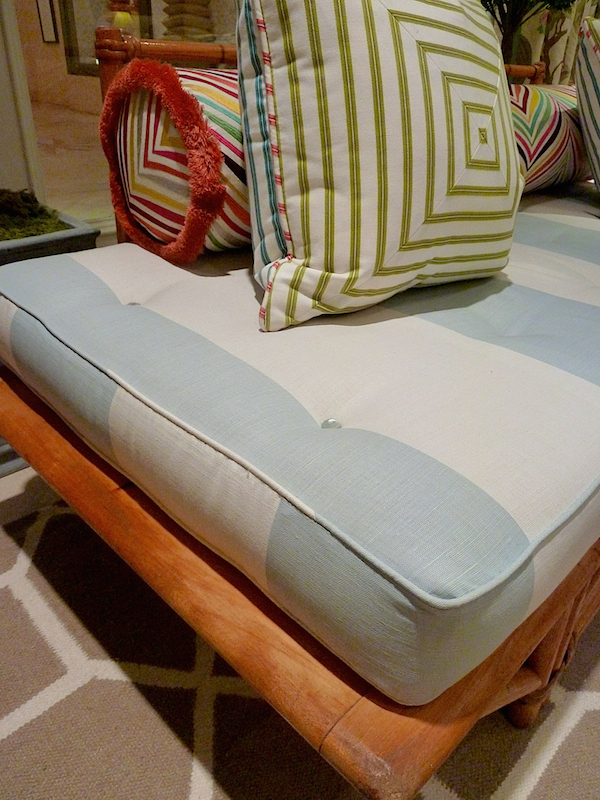 Stacey I love Lindsay’s bamboo daybed score and the pillows created perfectly for it! As you know I am into vintage bamboo lately!! 81 queries in 0.588 seconds.